Holland Green, 5-minute drive to Australian School at Mount Sinai Rise, off Holland Rd, Cold Storage Jelita. Completed: Around Jan 1999. Land from 401 sq. m (4319 sq. ft) to 477 sq. m (5132 sq. ft). Built-in 358 sq. m (3850 sq. ft) to 410 (4418 sq. m). Interiors: Living/dining - marble. Bedrooms - timber. Built-in wardrobes, kitchen cabinet with granite counter top, air conditioning system. Audio-intercom system. Jacuzzi instead of long bath tub in some units' master bedroom's bathroom. Bidet, water closet and show cubicle in such bathrooms. All 4 bedrooms have attached bathrooms. Facilities: Playground. Indoor jacuzzi or outdoor spa available in a few units. Very small garden and car park lot in each unit. A narrow road for expat children to cycle and play. Facades: 3 facades. Neo-Classical x 18 units (arched windows, fluted columns supporting the car porch, concrete keystone), Neo-Mediterranean x 17 units (arched windows, hip roof over car porch, keystone features), Neo-Victorian x 18 units (bay windows, pediment roof on car porch). Location within 10-minute bus ride to the United World College, Tanglin Trust, German/Dutch Schools, Australian School and modern bathrooms appeal to expatriates. An upper class subdivision as each bungalow is selling above S$4 million in 1999. No other similar subdivision of 53 brand new bungalows in this vicinity of Holland Road & Sixth Avenue. Within 5-minute drive to 2 supermarkets: Cold Storage Gourmet supermarket at Sixth/Fifth Avenue and at Cold Storage Jelita off Holland Road/Sixth Avenue. Caucasian wives' favourite lunch meeting place at Holland Village is 5-minute drive away. Not within walking distance to the subway. Buses to Raffles Place at least 30 minutes. Expats with no children may not want to live in this development. Long 15-minute walk to the bus stop at the main Ulu Pandan Rd if you have no car. No inground pool. Private garden too small for above-ground pools but may accommodate an outdoor spa. Expats to check whether the microwave oven, convection oven, hot water tanks, cooker hood & hob are available. A plot of cleared vacant land nearby has some construction. However, many Caucasian families can't be too fussy as there is an acute shortfall of detached homes in Singapore's expat enclave area of Districts 9, 10 and 11. The main complaint of Caucasian expats is the small garden plot and the small swimming pool. The space between the living and dining area may have a jacuzzi or water fountain instead. Neo-Classical (Type C/C1 Plot 15). 25 Holland Green, 3988 sq. ft built-in, 4347 sq. ft land. Garden only. Neo-Mediterranean (Type M/D2 Plot 17). 33 Holland Green.4036 sq. ft built-in, 4319 sg land. Garden only. Neo-Victorian (Type V/A1 Plot 36). 36 Holland Green,3831 sq. ft built-in, 4326 sq. ft land. Garden only. 31 & 55 Holland Green has pool & garden. Type: M/C2, 4418 sq. ft built-in, 4875 sq. ft land. 44 Holland Green has spa & garden. Type: C/B2, 3969 sq. ft built-in, 4408 sq. ft land. Occupancy Rate: Holland Green will be popular with Caucasians, being close to International Schools and Cold Storage shopping mall. As at Oct 30 2000, rents asked are above $10,000 as more expatriates have arrived in Singapore leading to a higher demand for bungalows. A top Caucasian enclave neighbourhood, known as Holland Road/Sixth Avenue area. Many Caucasians are shocked at the small garden size of this development and prefers older detached houses which have bigger gardens but not modern bathrooms. 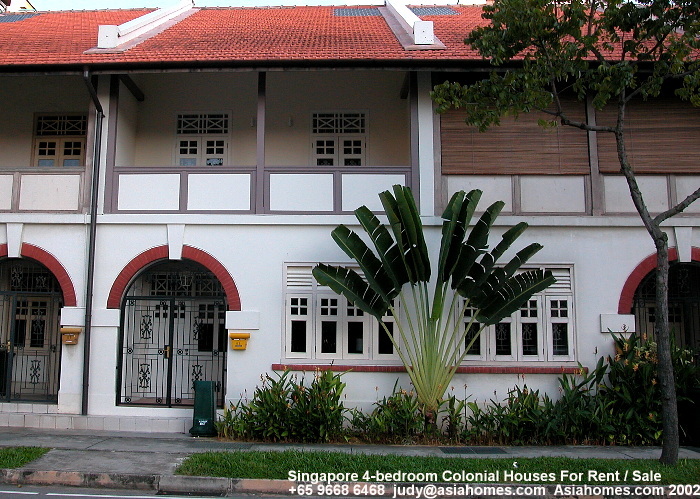 Due to shortfall of new bungalows in Singapore generally, rents asked are higher than the $6,000-$8,000 rental budget given to some expatriates looking for a decent bungalow, with or without pool. UPDATE IN 2011. There is still a shortage of bungalows for expatriate rentals. Competitors: A subdivision with new bungalows in District 9, 10 and 11 is a rarity in 2000 and most will be owner occupied since rental returns are very low, less than 2%. *Holland Grove View detached with small pool. One or two bungalows. Mainly semi-detached. *The brand new Tudor 10 detached houses in cluster housing with pool renting above $15,000/month. *Brizay Park detached houses in cluster housing with pool renting around $9,000-$10,000 presently fully occupied. *Watten area detached houses in cluster housing with pool renting above $10,000 presently fully occupied. *The new Greenwood detached houses with pool renting above $20,000. *The new Mera Gardens detached houses outside District 9, 10 and 11 are value for money, renting around $8,000, but it is not in an expat enclave area. School buses from the Dutch/German School do not go to this estate as at April 1999. Visit Mera Gardens. UPDATE IN 2011: A few hundred more new developments are available for rental in 2011. Some Landlords have various deductions when paying the standard agency commission. "We have our own agency commission payment forms," said the Secretary of an investment company when the Asia USA Realtor gave her the Asia USA's written agreement to pay the standard agency commission. She was only interested in the Letter of Intent and the tenancy agreement. There was no such form and therefore no written contract in case of dispute. After closing, she said her company's practice is to pay 2/3, not 100% agency commission! If the case goes to court, it will be much harder to win the case since there is NO written contract. It will be one party's word against another and the litigation expenses exceed the agency commission unless it is a Small Claims Tribunal case. The judge of the Small Claims Tribunal may or may not rule in the agent's favour. There are many Owners who stray from payment of agency commission but it is up to the Realtors to confirm verbally and in writing as to the payment of the industry's standard. The best time is to include the agency commission payment clause in the Letter of Intent. Commission less the maintenance fees for condos. Many investment companies and some private owners adopt this practice but will not inform you. Postponing payment of 50% of the payment in year 2 but not informing you till the tenancy agreement is signed. However, the Landlord has had accepted the agreement to pay agency commission upon signing of the tenancy agreement. 50% - 80% of commission justifying that he/she has had spent money on Straits Times advertisements or had given an exclusive marketing right to another realtor. Do ask the prospective Landlord before you refer cases. no payment of commission to agents by one government-owned company. Sorry you didn't ask the telephone operator earlier! payment of 80% or 90% by managing agents for developers. These managing agents are realtors but do not mention the commission structure since you don't enquire. payment of half of 80% payable by the managing agent who gets 80% of the rental commission by the Owner Developer. However, if you don't listen carefully, you think you get 80% of the commission. staff of Landlords who do not reveal to you that the commission payable is not the industry's practice. The staff says "standard commission payable" but the standard is the company's usual practice of payment which is below the industry's standard. payment for 2-year lease only even though you get a 3-year lease. To save on payment, the Landlord prefers a 2-year lease with option of renewal for one year or just simply tell you that you get only 2-year commission payment, take it or leave it, after your client has shown interest in the unit. It is best for the letting agent to be aware of the various intentions of the Landlord to pay less than the standard agency commissions so that there will not be disappointments or misunderstandings. The letting agent will then not be surprised after closure of the case to find that his earnings are much reduced.